Sign up for the jpopbooks Bulletin and get a couple of free short stories. Two stars from the upcoming translation of Uesugi Kenshin by Yoshikawa Eiji. Click for the first chapter The Beehive. Kuroda Josui, known throughout the novel as Kuroda Kanbei, was a chief strategist and trusted adviser to Toyotomi Hideyoshi, the second major unifier of the Japan of the Warring States (Sengoku) period. This novel imagines seven critical years in the first half of his life before he converted to Christianity (for a short time) and changed his name to Josui, and before Japan found peace. I'm currently translating a short story by Eiji Yoshikawa about the Ako ronin, the 47 ronin. Click image for an excerpt about Aomori. In 1944, Osamu Dazai returned to Tsugaru where he was born and raised to see the people and places that made him and to find the Tsugaru native to model his life on. For pictures and maps related to this book, look at the photo album Tsugaru by Dazai Osamu. A ton of pictures of his family is found on this Japanese blog (scroll to the bottom and click left << for the next entry). The first page shows his home, parents, and his aunt (mother's younger sister). Click image for chapter one. These are the first ten stories about the police detective Zenigata Heiji of Edo, now Tokyo. In the first story, Heiji witnesses the kidnapping of Shizu, the young lady who ignites love in him, and must rescue her from a satanic cult. In the last story, he must save the same woman, now his bride, when she is kidnapped on their wedding day. In the other tales, he confronts the challenges of other kidnappings, robberies, and, of course, murders. Click image to download PDF of chapter one. Meiji Era, Japan -- Toranosuke, the owner of a dojo for swordfighting, is also an amateur detective. He brings murder cases too baffling for the police to The Great Detective, Yuki Shinjuro, a handsome and brilliant man who has traveled to the West. Tora recruits the genius Katsu Kaishu to unravel the mystery in his attempt to outwit Shinjuro. After his investigation, Shinjuro unveils the murderer at the scene of the crime. In the final scene, Kaishu consoles himself for being wrong as usual, and Tora never loses faith in him. Two old Japanese tales are mentioned in passing in this book. One is Crackling Mountain (かちかち山: Kachi-Kachi Yama) in The Mystery of the Demon Religion, and the other is Hanasaka Jijii (花咲かじじい) in The Secret of the Clock Tower. Read Crackling Mountain or Hanasaka Jijii now. This casebook completes the classic murder mysteries solved by the Gentleman Detective, Yuki Shinjuro, with a bit of assistance from Toranosuke, Hananoya, and Officer Furuta. A samurai warrior is cursed to live in a time of peace. Saotome Mondonosuke is a samurai plagued by boredom. He is not a ronin, but a direct vassal with wealth, a license to kill, and a frightening but captivating scar. This book contains all eleven stories in the series 旗本退屈男 (Hatamoto Taikutsu Otoko) by 佐々木味津三 (Sasaki Mitsuzo), serialized in the monthly literary magazine 文芸倶楽部 (Bungei Kurabu) beginning April 1929. These stories formed the basis of the popular Japanese movie series of the same name [The Idle Vassal in English]. Click image to download a PDF sample. Is a dog man's best friend? This short story presents one man's struggle with that question. FREE everywhere but Amazon, please tell them. Click image for sample PDF. Dazai Osamu's major works were dark, but he also wrote humorous and uplifting stories. These books are two of his lighthearted tales. Pandora's Box details the experiences of a twenty-year-old youth in a quirky sanatorium in post-war Japan. Breaking up may be hard to do, but it can be funny. Goodbye was his unfinished last work about a man's machinations to break up with his dozen or so lovers. Before completing this work, he committed suicide with his lover; the two are pictured on the cover. Dazai Osamu (1909-1948) was a major 20th-century Japanese author of fiction. His most popular novels were The Setting Sun and No Longer Human. The online DAZAI Museum gives a nice overview of his life, family, literary works, and places associated with him and his works. Dazai Osamu also makes an appearance as a character in the Japanese manga series, and later anime series, Bungo Stray Dogs (文豪ストレイドッグス). Source of Dazai photos: Dazai Osamu, Dazai Osamu, Bunchosha, Tokyo, 1948. Click image for a screenshot. Learn all 80 kanji learned by first graders in Japan and 100 of the kanji learned by second graders. The stroke order to write each kanji and its Chinese and Japanese pronunciations are presented. You can learn fewer than 200 kanji and nearly 2,000 kanji-compound words containing them! Click to download practice sheets (PDF): one for 50 kanji characters and the other for 160 characters. Click to download a kanji chart of all the kanji Japanese students are supposed to learn in grades 1 to 6. This book has four stories. Each Japanese sentence comes with a glossary and the English sentence. The full Japanese and English text of the stories is included. Click image for an PDF sample. What are the odds? The train isn't going to crash. I'm not going to die. An imagined terror is often far worse than reality. In this story, a man must face his terror of a simple train ride. A pet dog once had a wonderful home on the scenic Lake Nojiri in Japan. His best friend and master left one day, but his unconditional love for his master never died. Before Astro Boy, the hero of the children of Japan was Hinomaru Hatanosuke, a samurai teenager, created by Nakajima Kikuo, a teacher and a manga artist. This series ran as a serial from January 1935 to September 1941 in the boys' magazine Shonen Club (少年倶楽部). Grab The Adventure Begins now. It's free! Grab Friend or Foe. It's free! Grab The Journey Home. It's free! The journey begins in The Adventure Begins: Hinomaru Hatanosuke, continues in Friend or Foe: Hinomaru Hatanosuke, and ends in The Journey Home: Hinomaru Hatanosuke. Here is the original manga 日の丸旗之助. Click image for free PDF of a few chapters. Oshikawa Shunro is credited as one of the fathers of science fiction in Japan. The Undersea Warship series was his popular series of six adventure novels. This novel, written while he was a student, was the first in that series. Get e-book of the entire exciting tale from Amazon and Smashwords Thanks. Despite the early death of Miyazawa Kenji and only an unfinished manuscript left behind, Night on the Milky Way Railroad has become a children's classic in Japan. A boy, Giovanni, has few friends at school, a sick mother, and a father working far from home. One festival night, he is swept onto a train traveling the Milky Way and into a fantastic world. Click image to download the story. Whitey, a happy dog, witnessed misfortune and it changed his life. He was driven from his home. Will he ever go home again? Picture from Shunpuku by Akutagawa Ryunosuke, published by Shunyoudou, 1923. Masaoka Shiki was a celebrated haiku poet and an avid baseball fan. This series of newspaper articles helped to introduce the game of baseball to the Japanese people. Take your vitamins! Suzuki Umetaro discovered an important one, Vitamin B. He is one of the venerated Three Taros of RIKEN. Here are some authors and scenes from books I may translate... someday. Sasaki Mitsuzo This story set in old Edo follows the adventures of a detective called Umon. Nomura Kodo Zenigata Heiji is another detective in old Edo. He flicks coins at the bad guys. Hayashi Fubou Our hero Tange Sazen is a fictional swordsman with one eye and one arm. 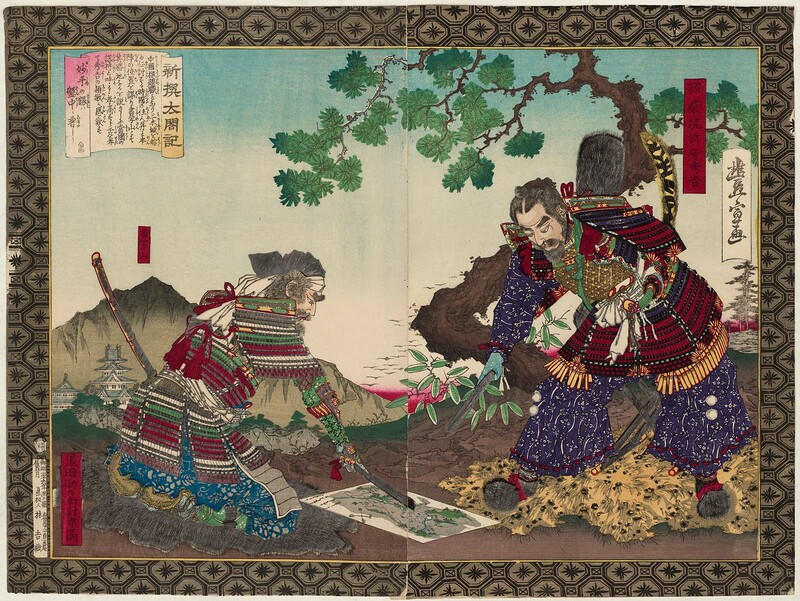 Sasaki Mitsuzo An imagined record of Amakusa Shiro, leader of the Shimabara Rebellion. Tanizaki Junichiro A continuation of Tanizaki's A Blind Man's Tale. Mayama Seika The tragic tales of five amorous women. Taruya Osen. Yaoya Oshichi. Onatsu [and Seijuro]. Osan [and Moemon]. Oman [and Gengobee]. Kunikida Doppo A diary of the the author's stay in Musashi Province. Yoshikawa Eiji The title says it all: Sword Trouble, Woman Trouble. This was Yoshikawa Eiji's first novel. All photos are from 漱石全集 The Complete Works of Soseki. MOJIZO - Drag and drop a picture of one cursive kanji character (崩し字、草書) to get a list (with pictures) of possibilities. Today I will learn Japanese!! Learn how to read and write hiragana using Japanese words you already know. Marugoto Plus will get you off to a great start. It teaches Japanese grammar, the writing systems, and some basic vocabulary. There are recordings of native speakers, animations that show you how to write the characters, and videos for a more lively learning experience. Japanese in Anime & Manga is for lovers of anime and manga on a quest to learn Japanese. This huge PDF (34 megabytes) わたしがしりたいせいかつ漢字 from Higashihiroshima FACE via the Agency for Cultural Affairs in Japan is packed with useful kanji for everyday life in Japan. Yeti says, "Thanks for visiting jpopbooks.com."